the flexible user interface, allowing users to change the weights and priorities of different constraints, and to add or remove constraints. Furthermore, the Bayesian Filtering Library (BFL) and Kinematics and Dynamics Library (KDL) of the Orocos project are used to retrieve stable estimates out of sensor data, and to specify robot and virtual kinematic chains respectively. The iTaSC software is licensed under a dual LGPLv2.1/BSD license. You may redistribute this software and/or modify it under either the terms of the GNU Lesser General Public License version 2.1 (LGPLv2.1) or (at your discretion) of the Modified BSD License. R. Smits and H. Bruyninckx. 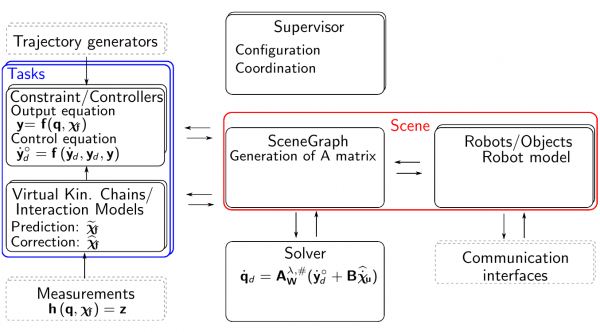 Composition of complex robot applications via data flow integration. In Proceedings of the IEEE International Conference on Robotics and Automation, pages 5576–5580, Shangai, China, 2011.